SALEM, OR -- The entrance to Sprague High School in Salem is lined with yard signs reading “Don’t Give Up” and “You Matter.” The messages of encouragement sprouted from tragedy after the loss of three Sprague students who died by suicide last year. Now two of their families are sharing their stories, offering advice for parents and the community to help prevent suicide. “I think the stigma around suicide has got to change,” said Carol McMann. Her son, Ben McMann, is remembered as a bright and popular kid who could light up a room with his smile. He was a history buff who loved to cook. He was passionate about football. “He was happy. He didn’t lead on to any anxiety or depression or anything that we’d have said ‘let’s intervene,’” said Kyle McMann, Ben’s father. Ben died of suicide on September 16, 2018. He was 14 years old. The McManns and Dr. Brown agree an important first step to address this crisis is to talk about it. The issue of suicide is especially acute among young people. Suicide was the second leading cause of death among Oregonians age 10 to 34 in 2017, according to the Oregon Health Authority. That same year, 18% of eleventh graders reported seriously considering suicide in the previous year and 6.8 percent reported having attempted suicide one or more times, according to the OHA. Parents need to have an open discussion with their children about how they’re feeling, even if they’re not showing obvious signs of depression of suicidal thoughts.“We have to learn to start asking questions in different ways, open-ended questions instead of closed-ended questions,” explained Dr. Brown. “Tell me about your English class? Then, let them talk.” Both parents suggest you remind your kids, it will be OK. They’ll get past the pressures of high school, even though the stress may feel insurmountable. Principal Craig Swanson helped guide Sprague students and staff through tragedy with messages of hope and inspiration. “We’ve got to keep talking about this because it is an epidemic,” said Swanson. Swanson believes counseling and suicide prevention programs can help save lives. Swanson said there are countless untold stories of students who got help by speaking up. “To see them successful and happy in life is a great source of pride,” said Swanson. The parents of Aaron and Ben believe everyone has a role to play in preventing suicide. Family, friends, coaches, teammates and neighbors should be looking for changes in mood and behavior, then ask about it. “It’s everybody looking out because you never know who that person is who they’re going to open up to,” said Kyle McMann. 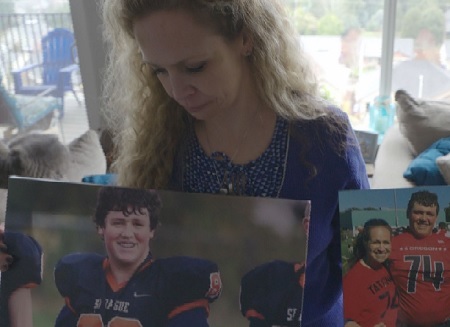 Photo: Linda McMann holds photos of her son Ben. Ben died by suicide in 2018 when he was 14 years old.